"Lizzy Ann Carrick of Orem shows off her clashing outfit, sneakers in Provo, Utah, Sunday, May 9, 2010." I'm heading home to Maryland for the weekend for an assignment. Actually sitting in the airport now trying not to fall asleep considering my flight is at 7:30 a.m. So I will not be posting for the next few days while back east as I will be fairly busy shooting and catching up with family, friends. But I wanted to leave you with this lovely-awesome outfit I encountered last weekend. 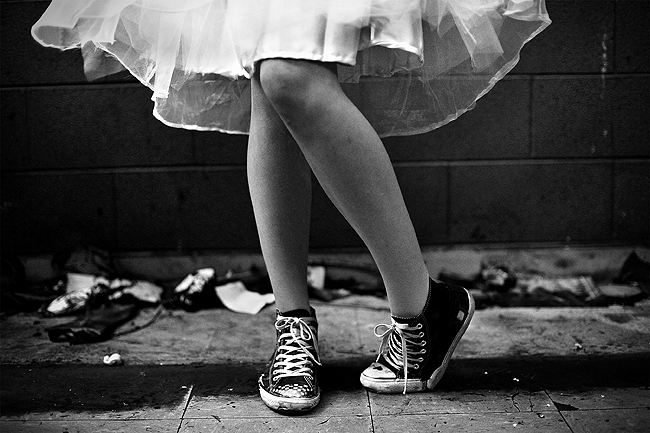 Nothing says fashion like a pair of beat up chucks and bright white skirt. I couldn't help myself but to grab a photo.